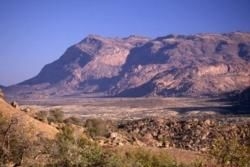 The Erongo region of Namibia’s name is derived from the beautiful Erongo Mountain Range dominating the skylines. Stretching out across the plains between the towns of Omaruru and Karibib, the mountain range is home to an incredibly rich natural heritage. Not only does it contain a wide variety of fauna and flora species, it also hides rock paintings and engravings. The Erongo Mountain Nature Reserve has been proclaimed in an effort to safeguard this wealth and encompasses an area of over 200 000ha. Thought to be the remnant of an extinct volcano, the highest mountain range rises about 2,320m above sea level. Three different ecosystems diverge into one; the desert from the west and a mix between woodland and savannah to the east. Around 200 bird species and wildlife such as elephant, mountain zebra, wildebeest, kudu, eland and oryx roam this region with panoramic scenery to add that extra special touch to an already incredible area. The Paula’s Cave rock art site at Erongo Wilderness Lodge contains beautiful rock art paintings and engravings.